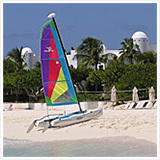 Anguilla Activities to Cross Off the Bucket List! Snorkel with narwhals. Swim with sharks. 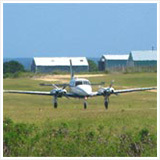 Jump out of a plane (with a parachute). 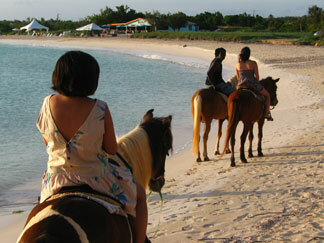 What about Anguilla horseback riding? 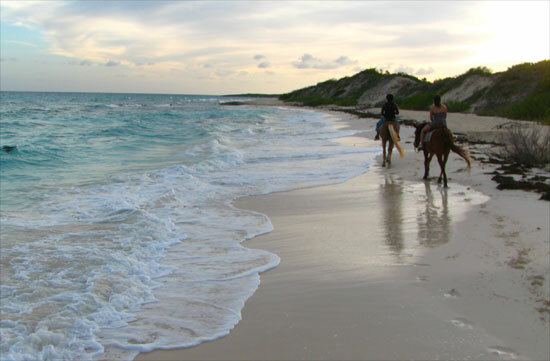 What about Anguilla horseback riding on the beach? 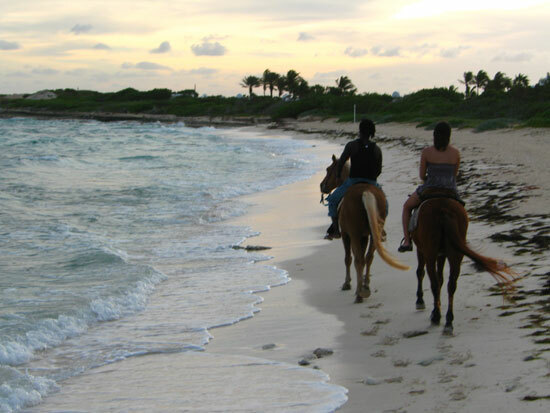 Anguilla horseback riding has been on our Anguilla activities bucket list since the very first time we watched a couple ride along the beach, envy in our eyes. 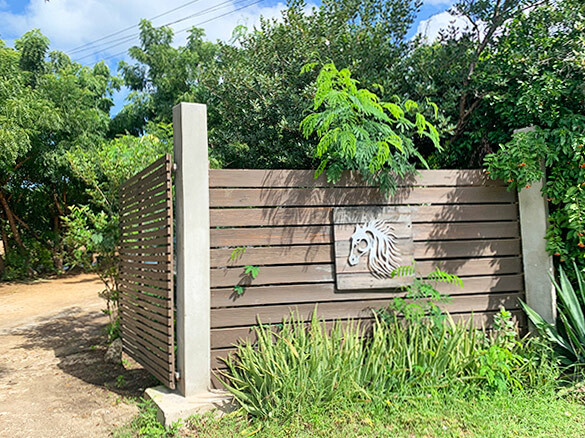 We didn't know that Anguilla even had horses! 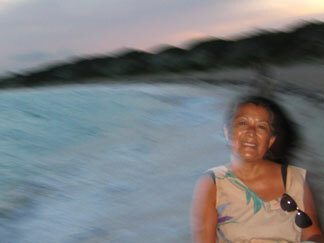 Tonia moved to the Caribbean decades ago. Originally from England, Tonia has long been an avid rider. 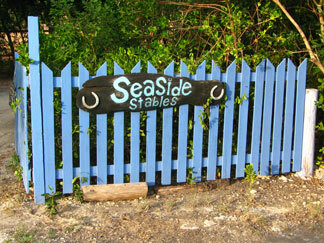 In 1994 she brought her passion to the island, and started Seaside Stables. 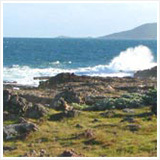 For years she was located in North Hill village above Katouche Bay. 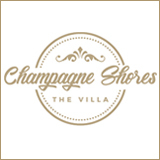 Today you can find Tonia and Seaside Stables at Cove Bay. 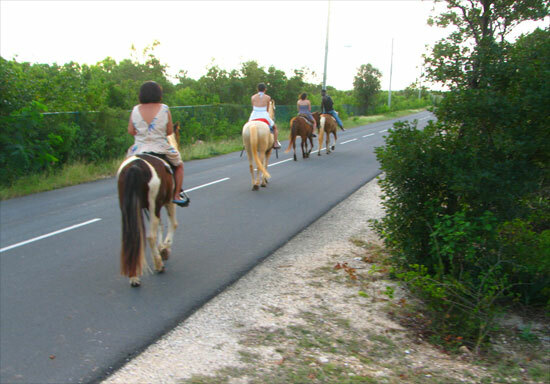 With a desire to finally experience the #1 Anguilla activity on our Anguilla bucket list, it was time to saddle up. A little shaky, and nervous about the ride ahead, Julio helped us mount our horses. We don't quite look like John Wayne, do we? Tonia says that most of her guests are first-time riders. No cowboy experience necessary! It was my and Yuki's first time riding a horse! My Dad had ridden once before in Cape Cod, but my Mom was the real expert. She later told us that the reason why she had such great command over her horse, Vegas (a little Palomino horse), was because she spent a summer as a child in Prince Edward Island, Canada with her family riding horses! Each of us and Julio were on our own horses. 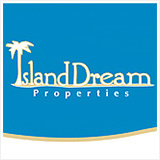 Tonia has 2 more horses on the island. They had the day "off," roaming free in a pasture in North Hill. The horses were friendly and gentle, calm and still, nice "trail horses." I wondered where Tonia picked up such enormous creatures. They certainly weren't bred here! I had only ever seen one donkey in Anguilla. 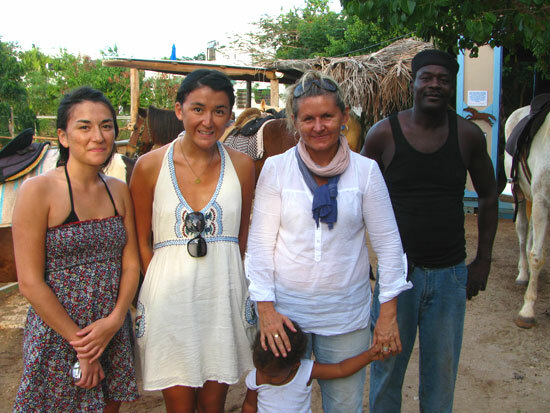 They all came from St. Maarten, apart from Jazz, Yuki's horse, who came all the way from France! After meeting our horses we were on our way. Julio set a gentle pace down to the beach. On the way I chatted with him. 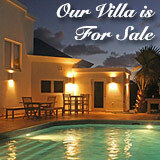 Originally from Dominican Republic, Julio moved to Anguilla in the early 90s. There was simply too much violence in Santo Domingo. 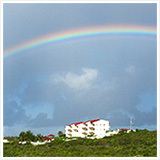 He was in search of a better life, and he found it in Anguilla. 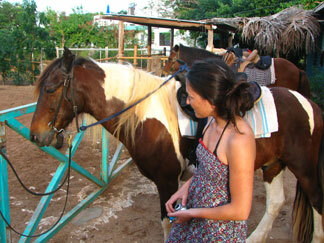 He had grown up around horses, and was very comfortable with Anguilla horseback riding. The whole time we felt comfortable and secure. He was consistently looking back, checking, ensuring that all of us first-timers were relaxed and happy. Cars drove by as we clip-clapped down the road, but the horses remained steady and calm. Anguilla Horseback Riding on the Beach! 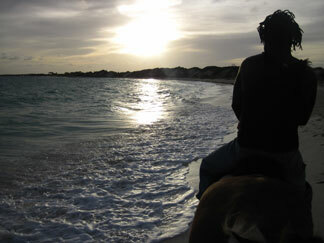 Sunset is a special time of day on calm, Cove Bay, and the most magical time for an Anguilla horseback ride. The sky shone an orange glow, the warm sun kissing our skin, the sand and the sea. We saw Cove Bay from new heights! 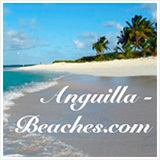 Cove Bay is one of Anguilla's calmest and biggest beaches. Most days while Anguilla horseback riding with Seaside Stables, the horses will head straight into the water for a refreshing swim. Tonia said that somedays her horses go right up to their ears, elevating their heads for air. It's up to you if you want to go in the water, though. Note: Tonia advises to wear loose-fitting clothes that you don't mind getting wet. Also, be sure to secure your camera around your wrist and ensure that your pockets are zipped shut. A few people have lost cameras, and various other things that have fallen out of open pockets. 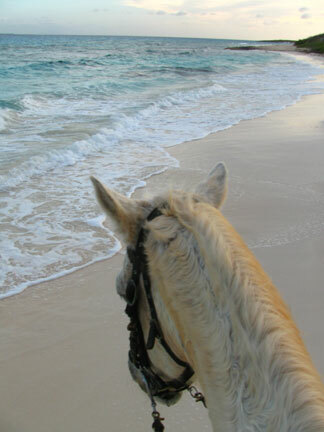 Too bad Cove Bay was choppy the day we went Anguilla horseback riding! Horses don't like going in the water when they can't see their footing, Tonia told us. That was fine with us for our first time! It was a sensational beach ride all the same. 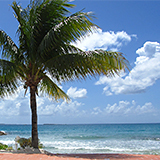 We love walking beaches, it is tiring of course, horseback riding though, on a beach, was incredibly relaxing, their pace and movements soothing. 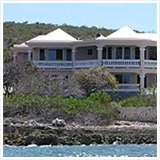 Since you don't get tired, you can walk the entire length of the beach from the Eastern jetty until you pass behind Cap Juluca on the Western end. It is the best way to experience Cove Bay so naturally! Cove Bay is wide and pure, Anguilla's sky expansive and clear, traveling by horse down the beach just feels right, so natural and timeless. 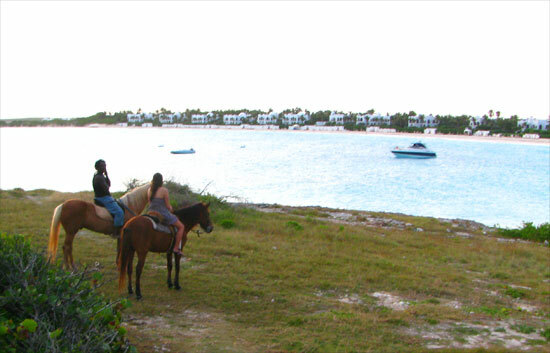 The tip of Cove Bay wasn't the end of the Anguilla horseback riding trail. Our horses went up and over the rough, volcanic sea-rock at the very tip of Cove Bay, before turning into Maunday's Bay. Yuki has always been wary of big animals, and had passed up every opportunity to ride horses with friends in Canada who had farms. Even Yuki relaxed on the way back and enjoyed herself. The sun had disappeared, the air was cool, the sky was twisting in shades of fierce pink and blue. 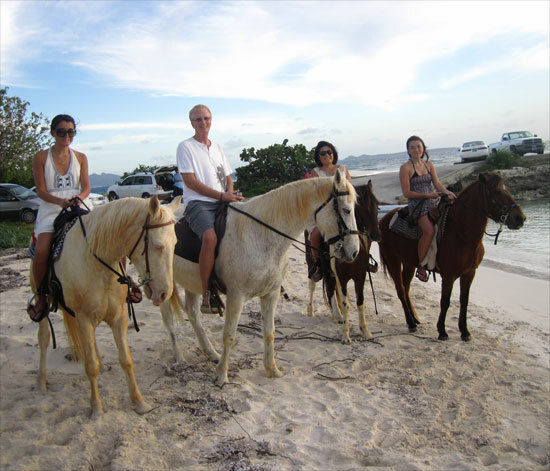 With your family, or a loved one, Anguilla horseback riding at sunset is a breathtaking experience. 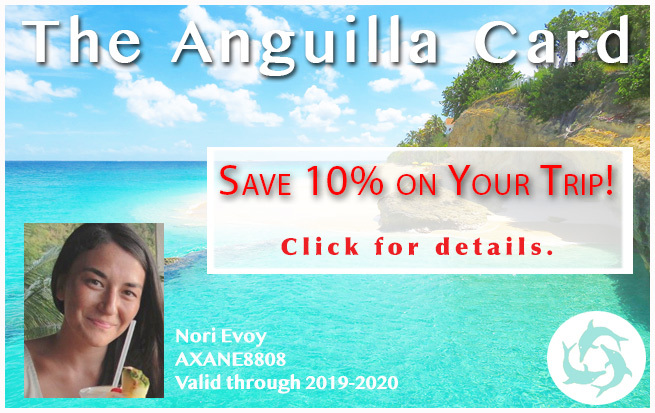 Back at the ranch, we thanked Julio and Tonia for kindly helping us cross our #1 Anguilla activitiy off of our bucket list. From the sky, to the sea, to the sand, to the horses themselves, it will forever be amongst our most magical memories.